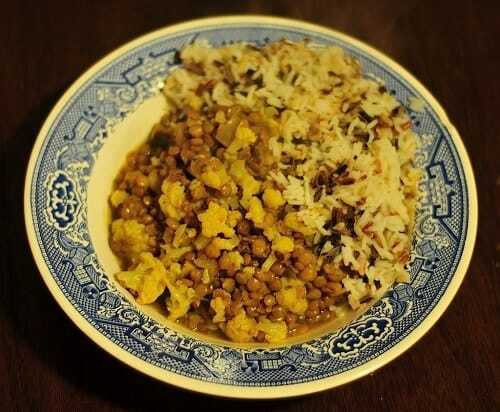 A delicious and healthy recipe, these Indian Spiced Lentils make a great main course or as a low side dish recipe. They are loaded with fiber and protein, making this a very filling and satisfying dish. For a couple more Points, you can add in some chicken breast, but primarily, it makes a great, well balanced Vegan Weight Watchers Recipe. The delicious Indian flavors are what makes this Indian Spiced Lentils recipe so yummy and palatable. And with each nice sized serving having just 5 Points, it’s a great bargain for all the nutrition it packs in. This one definitely remains as one of my favorite Weight Watchers Indian Food Recipes. Got a craving for Indian food, but don’t want to use up a ton of your daily Points allowance? Try these Indian Spiced Lentils, and get a tasty, healthy Indian food recipe that has just 5 Points for each big serving. It makes a delicious Vegan or Vegetarian Weight Watchers Recipe to serve up as a low calorie main course or side dish. According to package instructions, prepare the brown rice. Spray a large saucepan with nonfat cooking spray and set over medium high heat. Add in the onion, ginger, and garlic and cook until onion is softened, about 3 minutes. Add in the turmeric, cumin, and salt and cook for another minute. Stir in cauliflower and tomatoes and sauté for another 3 minutes, then add in the broth and lentils and bring to a boil. Reduce heat to medium low, cover and simmer about 30-40 minutes, or until lentils are tender. Stir in the rice and cilantro and squeeze in the juice from the lime halves. Delicious! I added to the recipe shown here 6 small multicolored peppers, one whole jalapeno, and a T of ground coriander. Otherwise, everything the same. Served it with Greek non-yogurt on the side to cool things down. Wonderful!!! Recipe is okay but I’ll use fewer tomatoes next time. Thanks for the recipe. I’ve been looking for something to replace my Lean Cuisine Indian Masala because I’m trying to reduce sodium. This recipe does the trick. I lowered sodium to 1/2 tsp but it still tastes great! I did recalculate the calories and I got 278 per serving. Still really low considering the amount in each serving! Maybe the brand of rice/lentils makes a difference or the veggies aren’t being counted? Anyway, great recipe and very healthy! This is delicious! And, it makes so much! Beautiful and tasty Indian dish for few points – I love it! Do you think it would freeze well? I’m single and it makes alot! Hello! Thank you for this recipe. (actually, thank you for so MANY of your recipes, your site is wonderfu) I made it tonight, and loved it. I will be linking to this post on my blog tonight!!! Best wishes!! !